It seems that an American blogger has been sending traffic to this page as he thinks this demonstrates how even the best Dutch infrastructure lets cyclists down. In fact, this particular blog post shows bad practice which we recommend is not emulated. It's one of several blog posts tagged "what not to do". For examples of good practice, see the blog posts tagged "what works". Good infrastructure is far more common in the Netherlands than the bad infrastructure shown here. van fills both the narrow cycle-lane and the narrow pavement. On-road cycle-lanes have long been controversial. They're a type of infrastructure which raises many questions. For instance, do on-road lanes make cycling safer or do they keep cyclists in the gutter where they are least safe ? Are they more or less convenient for cyclists than fully segregated cycle-paths ? Is paint enough to make cyclists safe in the presence of much faster and heavier motorized vehicles ? Do cycle-lanes create adequate subjective safety that they lead to mass cycling ? Where cycle-lanes exist, can they be integrated into good traffic light and roundabout designs ? 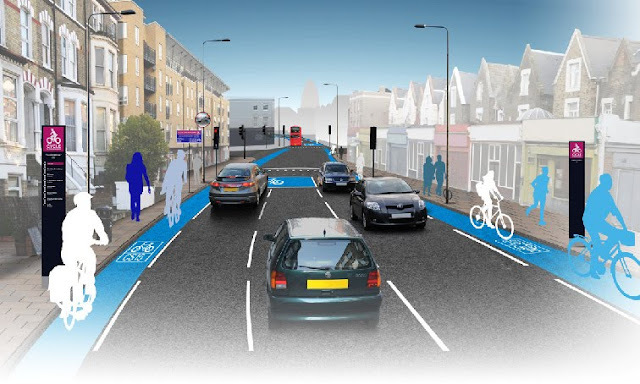 How should a cycle-lane lead into a segregated cycle-path, and visa-versa ? Ten years ago, guidance in the Netherlands called for cycle-lane widths of 1.8 m to 2 m wide with an absolute minimum of 1.5 m permitted where space allowed no more. These suggestions were considered to be adequate only where there were relatively small flows of cyclists. With higher usage, the lanes were to be built wider. Segregated cycle-paths were considered to be preferable over cycle-lanes where speed limits were 50 km/h (30 mph) or higher and on main roads with 80 km/h (50 mph) roads, cycle-lanes were considered not to be adequate at all. If there was no other possibility on an 80 km/h road then any lanes built should be widened by one metre. That's an extra half a metre to allow for bicycles to safely overtake other bicycles and another half a metre to give more space between motor vehicles and cyclists. The same guidance suggested a minimum 0.75 m wide gap between parking bays and cycle-lanes in order to reduce the chance of "dooring". Current advice in the Netherlands requires that on-road cycle-lanes should made of distinct red asphalt and be 2 to 2.5 m wide, with an absolutely minimum of 1.7 m. Such cycle-lanes must be red. All these are "concrete" absolutes. It is also now suggested that there should be a 0.5 m gap between cycle-lanes and car-lanes, the exact form of which is currently still under discussion. On roads narrower than 5.8 m, a fietsstraat (bicycle road) is the preferred solution. Note that such an arrangement requires both a low speed limit (30 km/h - 18 mph) and for through motor traffic to be removed in order to be successful. Otherwise cars will dominate and the bicycle road becomes simply a normal road where cyclists do not have any real safety. The Netherlands now has around 37000 km of cycle-path and just 5500 km of cycle-lanes. Bicycle Roads are even less common. It is clear that on-road cycle-lanes are deprecated in this country. They are not the preferred solution. There are far more new segregated cycle-paths than there are new on-road lanes. Note that the Dutch guidelines refer to what is considered to be reasonable practice in this country, where maximum speeds of cyclists are determined mostly by how hard they push the pedals and not by how quickly they can descend a hill. Where there are hills, cycle-lanes heading up-hill should be as suggested above but those heading downhill should be wider. More space is required to keep control of a bicycle at higher speeds. Extra space is also required to make safe the overtaking of one cyclist by another at higher speeds. This is analogous to how Dutch guidelines suggest wider cycle-lanes are required in the presence of faster motor vehicles. These are examples of where problems which could have occured with on-road cycle-lanes have been avoided by careful implementation. It's a short list and several of the examples below work well precisely because they exist in the absence of motor traffic. 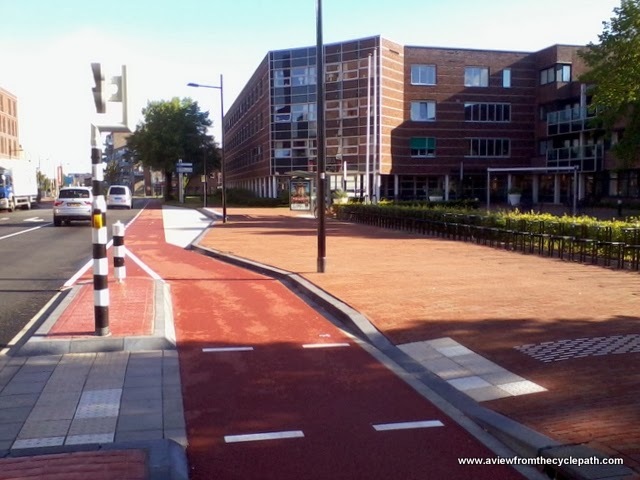 This 2.1 m wide cycle-lane in Assen is along a 50 km/h street which has carries moderate amount of traffic. It's not an ideal situation but the width does allow people to ride side-by-side and it is rare that it feels unsafe here. This is one of the better examples of cycle-lanes. Note that there is a pinch point for cars by the signs to the left of the car, but due to careful design the cycle-lane does not lose width at the pinch-point and this is relatively safe. There is a buffer between the parked cars and the cycle-lane to avoid "dooring". The distinctive red asphalt (not paint) also makes it obvious which part of the road is for cyclists. These "cycle-lanes" are 1.7 m wide on either side of a 2.7 m wide carriageway. But these are not really cycle-lanes and this is not an ordinary road. This is a bicycle road which cannot be used for through journeys by motor vehicle and on which cyclists have priority. The only reason why any motor vehicle is driven here is to access about half a dozen houses along this section of the bicycle road. These cycle-lanes are only 1.5 m wide but this is again not a normal road. This is a nearly car free street in the city centre. The junction ahead was once the busiest in Assen, but now has very light motorized traffic because this not longer serves as a through route by motor vehicle. The street allows two-way use only by bicycle and that is what is made clear by the painted lanes. In Groningen, this busy cycle-route goes over an older bridge which does not have adequate width for a segregated cycle-path. The cycle-lane splits from the road after the bridge and before a busy simultaneous green traffic light junction. Note that this is precisely the opposite of a "mixing zone" as has proven to be lethal elsewhere. Cycle-lane becoming a cycle-path immediately before a roundabout so that the junction can be negotiated safely by bicycle. Again, this is the opposite of a mixing zone, removing cyclists from the road at the junction to increase safety. The opposite side of the same road looks identical. A safe merge is provided from the cycle-path which leads from the roundabout onto the road. This is protected by a concrete kerb and because the cycle-lane is "extra" width. i.e. the painted lines separating the cycle-lane from the road line up optically with the side of the slightly narrower road used by drivers leaving the roundabout. This cycle-lane through a 1950s residential area in Assen does not really function as a cycle-lane. This street works well by bicycle because the road is no longer used in the same way as it was originally designed. While some streets in this area are busier than others, this street is considerably more pleasant than it once was due to unravelling of motor vehicle routes from bicycle routes. This is no longer a useful through route by motor vehicle and bicycles dominate. The width of the cycle-lane is almost completely irrelevant. Children can ride home from school five-abreast in comparative safety. 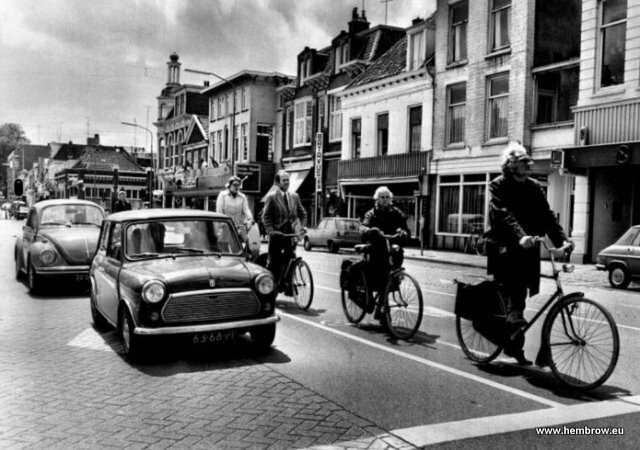 This example from Groningen is not all good because the cycle-lane is actually too narrow for this 50 km/h street. However I've included it in this section because it provides an obvious illustration of how to design car parking adjacent to a cycle-lane so as to avoid the danger of "dooring". There is a buffer between the edge of the cycle-lane and the side of the cars. In this instance, the buffer is not so wide as an open car door, but even this slightly narrower buffer reduces the risk because an opened door cannot intrude over a very large proportion of the cycle-lane. Sadly, most cycle-lanes come into the "bad" category. They're too narrow, they're not safe or they give an inadequate feeling of subjective safety to result in people wanting to cycle more. While the majority of these examples are in the Netherlands, bear in mind that these form less than ideal links within an overall infrastructure of very high quality. There are also very often alternative routes which are of better quality. Several of these examples are in Groningen. Like all cities which have many students, this demographic group, who are relatively easy to attract to cycling for a variety of reasons and will cycle more given any particular conditions than other demographic groups, helps to mask the problems with infrastructure. There are also examples from Cambridge, where the same applies. If you're trying to grow cycling in a place which does not already have a high cycling modal share, the infrastructure that you build needs to be better than this. To attract people from all segments of society to cycle, you need very high quality over a very fine grid. Narrow cycle-lane combined with pinch point in Groningen. That buses use this route makes it more unpleasant and more dangerous. The speed limit here is 50 km/h. This infrastructure reduces subjective safety of cycling. Where it is common, the more vulnerable members of society will not use by bicycle. This is very far from best practice in the Netherlands. Pinch points are usually designed out. 1.1 m wide cycle-lane in a 30 km/h zone in Assen. The cycle-lane is hopelessly inadequate in width. This couple riding side-by-side here do not both fit within the lane. This is a moderately busy road, though not on Sunday when this photo was taken. 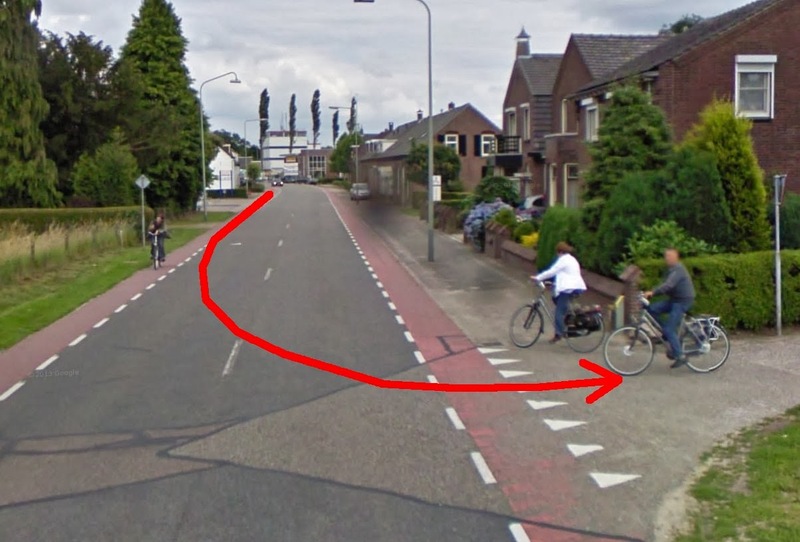 Like most of the bad examples from the Netherlands, this one is very easy to avoid when cycling. Much better infrastructure runs in parallel with this (a video shows how I usually go another way into the city). Note that there is one good feature. The parking bay does actually have a divider between the car and the cyclists. This should prevent "dooring" incidents. A street in Groningen which has recently been reworked, but which has kept very narrow cycle-lanes despite 50 km/h speed limit and use by heavy vehicles. 1.2 m width is really not close to good enough for the 21st century. This unsafe lane leads to a low degree of subjective safety, which can cause people to stop cycling. Looking left from the same point as where the yellow truck is in the photo above, the same inadequate cycle-lanes are invaded by almost every motorist who turns right here. There is absolutely no reason for this poor design. Everything left of this photo was built new in the last few years. There is no lack of space. At some points In the centre of this area, the pavements for pedestrians combine to nearly 30 m in width, yet cyclists were considered to be so unimportant that they rated nothing more than 1.2 m wide cycle lanes which are regularly invaded by motor vehicles. 1.5 m wide cycle-lane on a busy 50 km/h through road in Assen. This infrastructure dates from the 1980s when the old railway station was built. The junction that we are approaching is safe to use, but inconvenient and the narrow cycle-lane continues after the junction. The station is being rebuilt and in the near future this entire length of cycle-lane is to be replaced by a proper segregated cycle-path. The junction is to be completely redesigned. The busy through route by car will become a tunnel, removing the source of most danger. Cambridge in the UK. 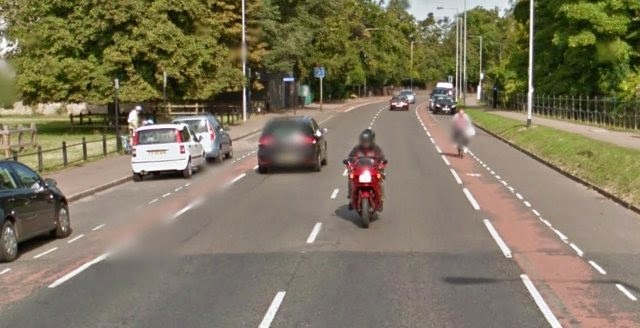 A cycle lane measuring barely over a metre wide on a busy road with a 30 mph (50 km/h) speed limit. There was clearly never a good reason for the cycle-lane to have been so narrow because in a few metres, right as it goes over a bridge where there might have been the excuse of there not being enough space, this lane widens to accommodate buses. From this point onwards, cyclists are supposed to ride in a combined bus/bike lane. Bikes and buses should never be combined in one lane as they are fundamentally incompatible forms of transport. Bikes need to travel at a constant speed while buses must necessarily stop and start, with a higher peak speed but a similar average speed. The result of this combination is that bikes impede buses just as much as buses impede bikes. This leads to dangerous overtaking manoeuvres and conflict. There really should be a completely separate bus lane or bus road here, and proper bus stop bypasses. Trumpington Road in Cambridge shows how not to construct a cycle-lane which passes parked cars. Parking is allowed on both sides of this busy road. The cycle-lane is narrow, badly surfaced and keeps cycles far too close to the "door zone". The volume of motorized traffic here is far too high for such a dangerous layout to remain. As was explained at the beginning, while well engineered cycle-paths are beneficial to cyclists, on-road cycle-lanes are really only a last resort measure. They should not be common in new developments because there is almost always a better alternative. They should not be used where there are high volumes of motor vehicles or high speeds. Where they are used they must be wide and junction design must remove potential conflict points. One of the "good" above shows how a lane cane become segregated at a traffic light junction. Where cyclists join and leave on-road lanes there are always potential conflict points. In the Netherlands there are now relatively few on-road lanes because better alternative designs are used. Existing cycle-lanes are being upgraded into cycle-paths. This is how it should be in other countries as well. Why implement the equivalent of 1980s Dutch or other inferior designs of infrastructure when you can instead copy more recent and successful designs ? This section includes examples of where the Dutch have recently made bad choices, where other nations are making copying from less than good examples and making bad choices and of some common problems due to cycle-lanes. Inexplicable bad design in Assen as part of a new development. There is plenty of room here for a proper bus stop bypass rather than encouraging bikes and buses to clash. Assen actually did better than this in the 1980s. Have the good ideas been forgotten by a new generation of planners ? The only redeeming part of this design is that it's appeared on a route which is not well used by bicycle. That's by design. This is where motor vehicles are sent to keep them out of the centre of the city. As I often point out, just because something can be found in the Netherlands, that doesn't mean it's best practice. Don't copy this. London has been struggling with making its ambition for "cycling superhighways" truly "super" ever since the idea was first mooted. This illustration from 2010 shows how limited that city's ambition for cycling is. These cycle-lanes are extremely narrow. They're narrower than any real life example above. This is simply not good enough. London's progress has not been helped by campaigners actually asking for infrastructure like this. On-road lanes still feature in many of London's designs. They are still planning to build them too narrow and they're still appearing on roads with far higher traffic flows than any of the Dutch examples above. What's more, they're still being combined with poor quality junction designs such as Advanced Stop Lines, which appear even in brand new infrastructure. Another example of an incredibly bad idea from London at a junction designed in 2013. 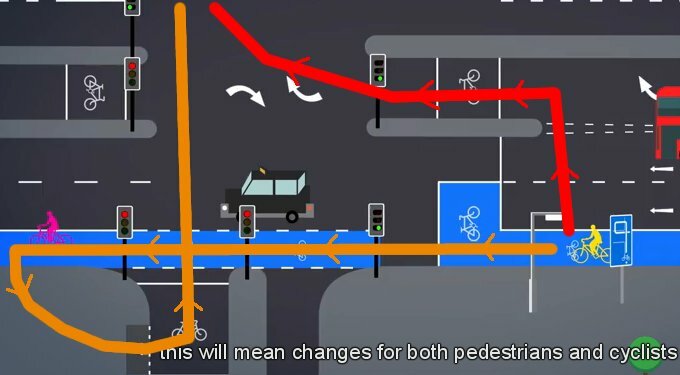 The orange line shows what TfL think cyclists ought to do, while the red line shows what people in a hurry will actually do. This does not support either less confident or more confident cyclists well. Both are required to do something unreasonable and both are required to make a choice between safety or convenience. If someone is late for work, convenience is likely to win. A well designed traffic light junction would have been both safe and convenient for all modes. 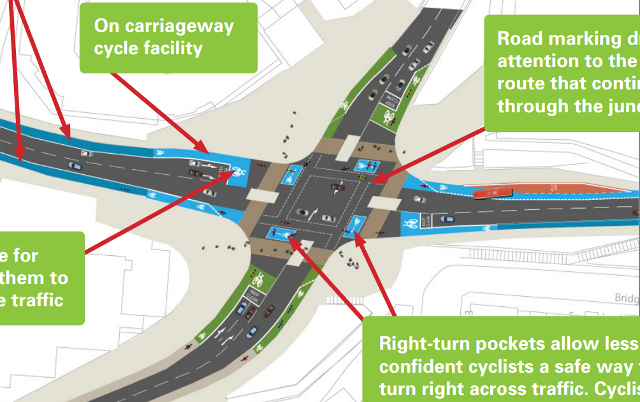 The dangerous situation that we got rid of in Assen decades ago is part of a new plan for Cambridge in the UK (in fact, they've actually already built junctions like this in this decade). This is just one of several criticisms that I have of these new plans. Here it is again in the Christchurch New Zealand cycling design guidelines. Don't do this. Don't repeat mistakes. This is a dangerous design. A similar idea as proposed for Ontario in Canada. Just one of the many problems with Ontario's new Bicycle Facilities Traffic Manual. Shared right turn zones (or "mxiing zones") like this have proven to be lethal. 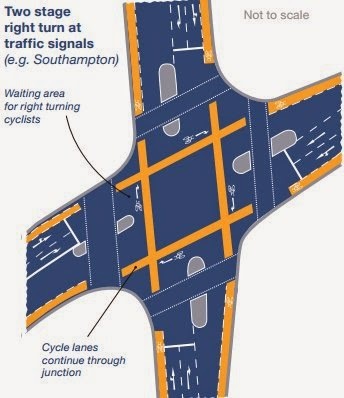 Update: When I was working on writing this blog post to illustrate what not to do with regard to on-road cycle lanes, Sustrans in the UK were simultaneously working on the Sustrans handbook for cycle-friendly design which promotes many of the same bad designs as I warn against. I've included here three examples of how they actually recommend bad practice, but more bad ideas can be seen in my review of their handbook. This first example shows a cycle-lane in the centre of the street. As explained above, this particularly causes conflict between cyclists and left turning cars. The second example shows Sustrans recommending the old-fashioned, inconvenient and proven to be lethal two stage turn design. They describe this as an "Innovative Cycle Facility". Cycle-lane widths recommended by Sustrans for new construction are very much narrower than are recommended in the Netherlands. As you'll read above, ten years ago the Dutch recommendation was already a width of 1.8-2 m with an absolutely minimum of 1.5 m. The new recommendations (detailed at the top of this blog post) require lanes to be somewhat wider in the Netherlands. The route which children in Oostrum have to take to get to school. There have been crashes here between children on bikes and overtaking cars. This manoeovre is difficult to perform without error every time. Sustainably safe conditions require that people can make minor errors without resulting in injury. This is simply not adequate. It's an example of how fears that a cycle-lane can keep cyclists in the wrong position on the road to make a safe turn are realised, though the best solution is proper segregated infrastructure which makes it clear who should be where and when, not simply to delete the cycle-lane. When there is snow, a cycle-lane is more difficult to clear effectively than an off-road cycle-path (see examples of effectively swept cycle-paths). What's more, the consequences of a cycle-lane not being properly swept are more serious than they are for a cycle-path. The dirty ice and snow from the road builds up at the edge of the cycle-lane near the parked cars. This can be slippery, it can hide obstacles (kerb, litter, stones, manhole covers) and it effectively narrows the cycle-lane from the outside towards the traffic side. Note how the bicycle symbol is no longer in the middle of this lane, which is 1.9 m wide in summer time but somewhat narrower in winter due to the conditions. In the event of a fall, the cyclist could end up under a vehicle being driven on the road. Similarly, road sweeping tends to accumulate debris at the side of the road. The cycle-lane is a good place to get a puncture. The same bicycle road as featured in the second main photo from the top. The two postal workers wearing yellow and heading towards the camera show up very well in the snow. However, there are also two cyclists heading in the opposite direction who have nearly disappeared. We should not rely upon people wearing special clothes in order to show up in varying weather conditions. In any case, the same clothes do not work best in all conditions. This is a safe situation only because these "cycle lanes" are not really cycle-lanes at all. It's a bicycle road on which there are almost no motorized vehicles except those which belong to residents used for access. Segregation removes the danger associated with not being seen whatever the weather conditions. Another example of a truck using a cycle-lane in Assen as a parking space. This is a universal problem with on-road lanes. Cyclists have to pull out to pass, which puts them in a dangerous position potentially having to merge with faster traffic. It also prevents the cyclist from making such an efficient journey as they would if they could travel uninterrupted by such obstructions. Another example from Ontario's lacklustre design guidelines. This treatment of a road narrowing is very dangerous. 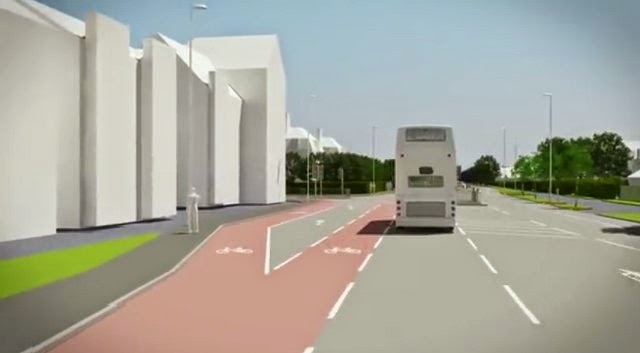 The designer left out any means of keeping cyclists from being hit by motor vehicles as they attempt to move left into the main traffic lane. This creates the same dangerous situation as does the truck in the photo above, but it does so permanently and by deliberate design. This is an example of extraordinarily bad design. 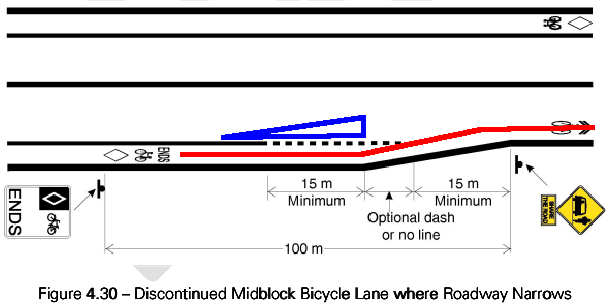 I added the red line to show the route of a bicycle and the blue triangle to represent a means of forcing motor vehicles to the left where cyclists are expected to join the lane. In the Netherlands we would expect there always to be such an alignment in order that this most obvious of conflicts would be avoided. Design guidelines which include such bad advice as this are simply not worth the paper they're printed on. It's only substandard infrastructure which really has a cost. If it's substandard then it won't be used and that means that there is a cost but no benefit. Really good cycling infrastructure has benefits beyond its cost. On-road cycle-lanes are not the best way to keep cyclists safe. They are also rarely, if ever, the best way to improve convenience for cyclists. If on-road lanes are a preferred option in your part of the world then your planners are aiming for something rather lower than the best standard possible. Aiming for a lower standard of infrastructure means aiming for a cycling modal share which is lower than the highest possible given your demography and geography. You set a ceiling on what is possible by building inadequate infrastructure. If your infrastructure is being designed to a lower standard than that of the Netherlands, why is this so ? Are your cyclists less valuable and less important than Dutch cyclists ? Do you want fewer people to cycle than would cycle in the Netherlands ? In the worst examples, cycle-lanes can be very unsafe. Bad junction designs greatly exacerbate this problem. It can also be worsened by bad weather, bad lighting or inadequate maintenance. There are very few on-road cycle-lanes which can truly be categorized as "good". Cycle-paths separate from the road are far more successful at keeping cyclists safe than paint on the road. Unravelling of routes so that roads which cyclists use are not filled with motor vehicles leads to increased safety. Martin, it's very unfortunate that CBR can't see further than either shared paths (which don't work) or on-road lanes (which also don't work). As for costs, it's only substandard infrastructure which really has a cost. If it's substandard then it won't be used and that means that there is a cost but no benefit. Really good cycling infrastructure has benefits beyond its cost. Thanks for continuing to highlight good and bad practices, David. Here in Tasmania we will continue to battle for separated paths, but the pro-car lobby is very powerful and all that our governments can see is the costs. V interesting post revealing the lack of ambition among cycling groups in Uk, where we are supposed to be happy with the scraps from the table, even when starting with a blank sheet. Take our v own award winning 'gone dutch' cycle lane in Camden, which has an effective width of 1.3m (with the silly planters) and 1.6m (with the silly and ineffective armadillos). When challenged on the width, the local cycling group can only say 'the width is sufficient for overtaking with a little communication' and slightly pompously 'cycleways shouldn't be like motorways where the fastest rule!'. The thought that cycling sociably side by side as shown in your photographs might be something to aim for is beyond our reps. And no shortcomings can be acknowledged because this is award winning, and the cycling groups are photographed accepting awards for this stuff with the local councillors. Unfortunately, other Councils in London now think this is the standard to aim for and are planning to roll out similar. It's award winning after all, what more could you want? The point about being overly celebratory about "award winning" infrastructure is well made. It can only result in stagnation. 1.3 m wide effective width lanes are very far from being wide enough and should not be what other places aim for. This is why it was important for Groningen to lose the cycling award in 2011. Campaigners made such that this happened because they were not happy with what they considered to be merely OK infrastructure. So what I'm actually reading here is that POORLY DESIGNED cycle lanes are bad; that's not surprising, poorly designed cycle paths (e.g. crossing driveways/side-roads with limited sight distance) aren't great for safety either. We should be campaigning for well-designed cycle facilities, whatever stripe they are. Now I'm the first to accept that on-road painted cycle lanes (even well laid-out and well dimensioned ones) won't attract a fair chunk of the "interested but concerned" population out there (although a few well-placed cycle-lane separators/posts might help). But, compared with NOT providing anything for cycling (which unfortunately is where many places are starting from) they do provide a safety benefit. We found in research in Christchurch, NZ, that the introduction of painted cycle lanes along various routes in the 2000s led to a 23% average reduction in the cycle crash rate. For more details see http://cyclingchristchurch.co.nz/2014/02/08/are-painted-cycle-lanes-dangerous/. So, if faced with the choice of (a) doing nothing because a cycle path option is politically too hard/difficult/costly or (b) putting in well-designed painted cycle lanes, I'll happily support the latter (at least as an interim solution). Glen: I find it bizarre that you read what I've written above and assume that there even is such a thing as a well designed cycle-lane. Actually, I state that no on-road cycle-lanes are truly good. The best example that I show, and it really is a good example, is described as "not ideal". There is a reason why the Dutch language article that I link to above states that from now on cycle lanes in the Netherlands *must* be built 2-2.5 m in width and coloured red. This is not optional: it is a "concrete" requirement. Narrower lanes have proven not to be safe and that's based upon decades of experience of a range of different designs. Very wide on-road lanes work reasonably well given limited enough circumstances. i.e. when there are no side-roads, no junctions, where there is no-where that anyone might want to stop and park a motor vehicle on the lane, where traffic volumes and speeds are low and where you never have bad weather. If those conditions don't all apply then the problems that I have demonstrated above will be seen on your cycle-lanes and on those in any other town. While relatively self-assured adults might find the conditions conducive to cycling, on-road lanes are rarely enough to convince adults to let their children cycle, nor for them to suggest that their grandma should cycle. A classic case of a subjective safety issue. The positive result that you claim is based on a very small sample. The Dutch have done much more comprehensive research over a much longer period and it is that which resulted in the guidelines which we currently have in the Netherlands and upon which I base my blog post above. As for what you support, you must bear in mind what your target is. If a few percentage points of additional cycling is enough then set your sights low and you may well achieve those percentage points. But that's all you'll achieve. The minimum quality of infrastructure that you support determines the maximum modal share for cycling that you can possibly achieve. If you aim low then your achievements will not be large. 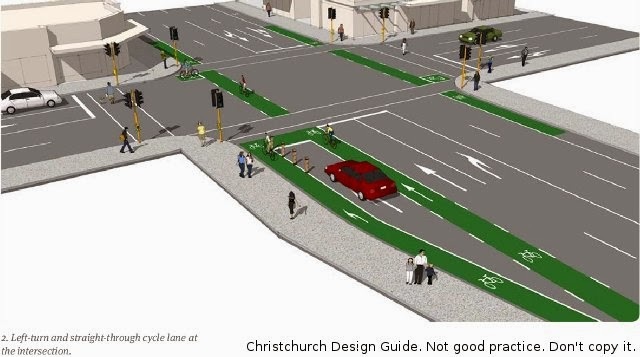 I must also point out again that the Christchurch junction design featuring cycle-lanes which I feature in the blog post above is absolutely not safe. This is a design which injures and kills people. I hope you are not supporting this design as this should absolutely not be built. Not in Christchurch and not anywhere else either. BTW, posts at the sides of cycle-lanes act to narrow to usable width of the lane and can be very dangerous for cyclists. I spent part of yesterday showing study tour participants exactly why this is a problem on a very old cycle-lane in the Netherlands. They should not feature in modern design. Martin, the key point is that cycling infrastructure needs to be of sufficient quality (eg width) so that cyclists can pass one another with no problems. There is no such thing as infrastructure for "slow" cyclists and infrastructure for "fast" cyclists, there is only inconvenient/poorly designed infrastructure and high quality infrastructure. As for money, we both know it is a myth. In Sydney they are spending $3.5 billion on a single road and In Adelaide they spent over $800 million on a single overpass (which is the biggest monstrosity in our city). (note to international readers that 1AUD=0.93USD at the present moment). Our planners have no problems spending billions on roads for marginal improvement. I'm guessing our international visitors for the 2014 Velo-city Global conference aren't going to be impressed. I can understand the logic behind thinking that not asking for too much is politically easier but it really isn't easier. The experience in Vancouver has been that there is as much opposition to implementing low quality cycle infrastructure as there is to implementing high quality infrastructure. So given that there will be a political fight no matter what is requested, why not then demand high quality? David, have you actually entered into a dialogue with Sustrans to establish why they continue to promote designs which you have shown are far from ideal? It would be most instructive to read their rationale for supporting the schemes in their literature. Sir Velo: I've tried in the past to engage with Sustrans. I've also invited Sustrans to send people on a study tour so that I could demonstrate best practice to them. Unfortunately, they've never shown any interest. Unfortunately, there is much that Sustrans get wrong and cycling in the UK is being damaged by these mistakes.